LED lighting is the newest technology to hit the market. LEDs are notoriously efficient, and this 90W light uses 90 individual LEDs to reportedly achieve the same grow-output as a 400W HPS/MH system. They are lightweight, portable, efficient, and give off less heat than their HID counterparts. Best of all, the bulbs tend to last MUCH longer and you can go many years without having to replace them. I used it to extend my growing season since I started my seeds very late and wanted to finish them without risking a frost. I was able to get beautiful flowering results from all of my plants, and the fruit continued or increased developing on all of them that were in good proximity to the light (in a 2-3' [60-90cm] diameter light footprint). It's important to note that while the light is much more efficient than the HID lights, it does not give off more lumens. This is because an LED light is only capable of giving off one wavelength of light, unlike all other lights that give off a range of wavelengths. As a result, combining different LED colors can target specific photosynthetic pigments and give only wavelengths that the plants will use rather than flooding them with a lot of unnecessary green and yellow light. Plants use mainly red, orange, blue, and violet light to produce energy, so white light wastes a lot of power on wavelengths that the plants don't use. This is why plants appear green; they 'spit back' the green and yellow light that they aren't using! -There seem to be many that fail partially or completely in the first month. When I brought my plants under the light I noticed an immediate explosion of growth. My Tabasco started growing much faster, and my Bhut Jolokia flattened its leaves and basked in the new lighting (I don't think it liked it outside for some reason). Fruiting continued if not increased, and the plants loved it. My most aggressive-growing plant was a Charleston Hot. It drank double the water of all the other plants, ate triple the fertilizer, and loved light. Unfortunately I let him drift a bit outside of the growing radius and he browned/yellowed in a few weeks and started to die. I had a total of five fruiting plants under the lights at this time, so I reduced it to four and the rest seemed to be doing fine. Make sure that you don't save too many plants for this light! Four plants should grow alright, but this is not really meant for high-volume use. You can probably use it for the first month or two of growth for a good number of plants, but don't expect to get a lot of fruiting plants with this one. I am still trying to figure out the flower-dropping on my Bhut Jolokia under this guy, but I am 90% sure that it's not a lighting problem. Also remember to get your plants right under the light and keep the light ~30cm (or less) from the tops of the plants if they are fruiting. The heat output is very low, and there are even three fans built into the tiny round light. This is nice and the fans are no more irritating than a noisy computer. My plants have shown no signs of any sort of light burn, even quite close to the unit. I haven't had any problems with the cold yet, but I'd imagine if the room gets particularly cool in the winter additional heat should be added to the room. You can't rely on this light to warm your plants! Recently I noticed that about a dozen of the LEDs aren't lighting up and I contacted the manufacturer for a replacement. Oddly enough, they seem evenly spaced, so it could have been one color that went out. I will keep you updated on that. It seems that this is a frequent problem, and some lights even have one power unit go out inside them which can cause most of the LEDs to go out. I'm not sure if they are burned out/faulty LEDs or if it's a different problem. Unlike HID lights, LEDs are very numerous, so the circuitry involved in building them is more complex and more likely to break down. **Update: After I contacted the manufacturer they informed me that these in fact were the 16 infa-red LEDs that are used for a better wavelength span. They are invisible to the human eye. The light is very blinding if you are observing your plants when it is on. Not only is it very bright, but the deep pink color isn't exactly pleasant on the retinas. Whenever I look at my plants I have to turn it off or only observe for a few short moments. I wouldn't recommend putting this in a room where you are in frequently unless you can put some sort of shield between you and your plants. It's meant for them, not you! Here's a shot of one of my plants about a week after getting put under the new light. The fruiting and flowering absolutely EXPLODED when it got the new rig, and it was using good ol' outdoor sunlight before that! I'll answer any questions to the best of my ability. This is the first major grow light I've owned so I can't really compare much to HID results. I also haven't tried seedlings under this light yet, but will be starting some soon and will keep you guys posted! Very interesting. Something i may consider in the future. A picture of the light at all? Bought some in Dubai in 2009 as i had seen a large industrial grow test when i was working there,the same company where also testing the 90 watt U.F.O LEDS Lights and was so impressed i bought a couple back with me to the u.k. Through Autumn/Winter 2009 the growth rates where amazing and the light spread across large plants in a 4/5 metere area was very impressive,would recomend these without question. were can you get them from in the uk? looked on ebay but not sure as some come from china , hong kong etc, seen one on growlightsled.co.uk but dont know if the same product. Seems like you know your led's! Do you know what kind of light is best for the plants? Im going to order some led's and combine my own. I was thinking about 20% blue (465 Nm) 10% orange (625Nm) and 70% red (660Nm). Any thought on that? Im not the best when it comes to lights so im thankfull for any tips! Sadly LEDs are still an inexact science. I haven't seen a single ratio that has been confirmed 'the best' for any particular plant. I recommend that you read as many reviews as you can before you go setting down some big bucks on a light like that. If you find this light, I recommend it, although after more experimentation I find that it's only good in a relatively small radius. I had a bit of trouble growing more than 3-4 plants in fruit, but this might have been an issue with the height of the lamp. It seems that the ratio you want needs to be high in red, presumably because red light is necessary for growth (and especially flower!) but contains less energy per lux than blue light. If you are only planning on starting your plants with an LED (only the first month or so after sprout) I would recommend trying CFLs or another low-cost option, as this light is overkill for that. Some of my seedlings actually started getting a suntan from this light when I tried it this year so I pulled it for a couple CFLs until they got bigger. When in doubt, read reviews! The guys that grow weed know lights better than all of us so don't be afraid to browse those forums a bit for advice. Unfortunately there's a bunch of stoners that don't know what they're talking about, so be wary. 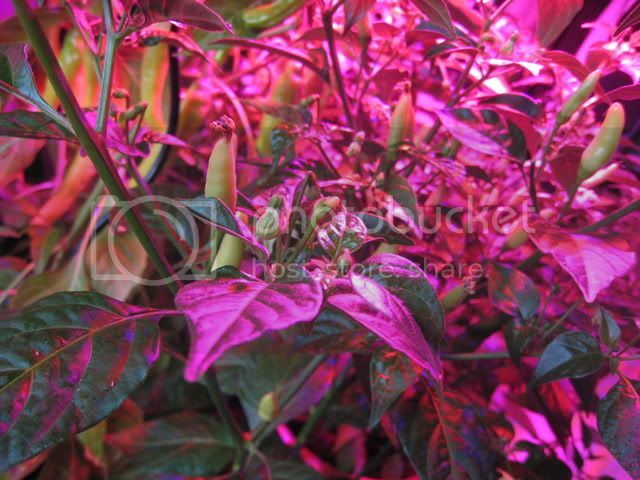 I have a 90w UFO led (2w per dioed) and my chillies loved it. My grow space was about 170*109cm. and i had 9 chillies in there, 6 big ones flowering and 3 Bhut jolokia growing. I had the light about 50-70cm from the plants to get the light radius i needed and they seemed to liked it. The thing that suprised me the most was the Bhut Jolokias, they were about 120cm from the led (!!) and they looked green and healty. They didn't grow fast at all but they stayed very green and looked good, for being so far from the light id say thats pretty good! But as i moved the Bhut Jolokia into a DR60 grow tent with a 250w MH they exploded in growth, holy hell i have never seen a chilli plant grow like that! My brother has the same led as me but with 50w. Anyway.. Its hanging about 70cm above they plants and he has been growing them like this from seed and they results are really great. Its just some normal cayenne long slim but they are branching like crazy and there only 15cm high!!! Matty wrote: Im just starting to plan for the winter and im just wondering are these the same lights? Also for starting of seedlings can't you just raise the lights somewhat? Im after keeping some plants on tickover during winter and starting off seedlings off so is this light a good option? It's not the same brand as mine so it's hard to tell exactly what you'll get with that. It's meant to look the same as my light but who knows. Some of those end up getting crappy LEDs put in em that won't give you what you want, but not all of them. You can raise the light and it should be fine for seedlings, and seedlings will take pretty much any light they can get and grow decently. I haven't tried very many LEDs and I've heard of a lot of people getting their grow season screwed up from a cheaper light made in china, so I'd feel uncomfortable recommending a light that I haven't used. I bought one of those led lights a few months ago only used it for a couple of days wasn't that impressed with it went back to hid light. I am going to give it another go when I cut all my plants back at the end of the year. The only way to go unless you own the power company. Do not be afraid of chinese LED fixtures, most are made their even if the company is from elsewhere, what you look for is Cree though most manufactures of diodes are up to snuff these days the days of dodgy products from China are fast disappearing. For growing they will thrive under an LED with vegetative growth and prolific root growth at 18 hrs per day. Last winter I had some Manzano plants growing and producing all winter under two 300 watt LED's at 12 hrs, these lights have been running for three years now all winter and spring for the new seedlings and they came direct from China, you have to deal with a reputable company not someone on e-bay, usually they come with a two to three year warranty, you will pay less than half you will pay from a domestic store.My tractor is from China and is 5 years old and if I want parts they will send for free try get that kind of service anywhere else. Matty wrote: Thanks very much dude. You seem to know loads about lighting!-what sort of tube lights would you recomend as an alternative?-The only thing i've grown with lights before is aqautic so i don't really know where to begin with a setup- im going to go with an under the stairs growing cupboard/nursery so no natural light avalible. Have you decided the wattage you are aiming for? I'm looking at growing Chilli's indoors after the poor sunshine hours in UK this year. I'm thinking of buying a 1.2m x 1.2m x 2.0m grow tent. It would be more that enough - 50 W will be enough if you are using quality diodes like Cree. Excellent, thanks for replying Anja.